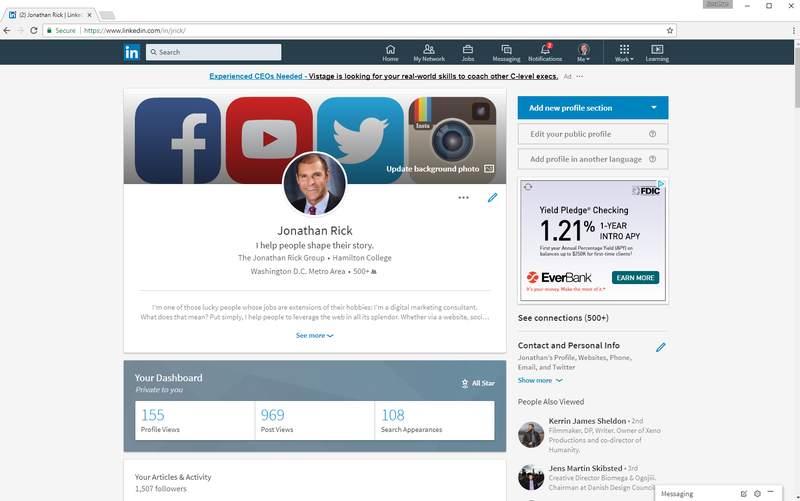 Your LinkedIn Profile Could Be Better. I Can Help. I run a digital-marketing agency in Washington, D.C., and have done LinkedIn work for more than 100 professionals — writers, consultants, executives, academics, students, founders, lobbyists — even craftsmen. I love doing this stuff so much that I also teach it at the University of Maryland. We’ll do a phone call wherein you identify your goals, describe the vision for your new brand, and highlight the key points of your career. You’ll send over any materials you think may be helpful, including a résumé (this is the most important), a list of awards and certifications, news articles, and anything else you’d like to incorporate. (Don’t worry at all if you lack material; I can work with whatever you have.) At the same time, I’ll conduct independent research to fill in the gaps and integrate any additional info. Using the above info, I’ll prepare a new profile for you in a Microsoft Word document. This includes a variety of new taglines you can use to pitch yourself. When done, I welcome your feedback via the phone or track changes in Word. I’ll make your new profile live, then help you execute a battery of best practices to promote it (including tested ways to garner endorsements and recommendations).